A bulldog is the common name for a breed of dog also referred to as the English bulldog or British Bulldog. Other bulldog breeds include the American bulldog and the French bulldog. The bulldog is a muscular heavy dog with a wrinkled face and a distinctive pushed-in nose. Bred from the Asiatic mastiff, the Bulldog was originally bred in Great Britain. This breed's main function was that of a participant in the blood sport of bull baiting. They were also used against bears, other vicious carnivores, and lions. During the 19th century purebred Bulldogs were very rare due to the enactment of the anti-baiting laws. 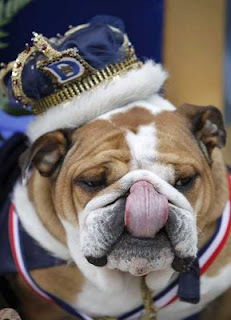 Today the Bulldog is a family companion and show dog and is very popular. This Animal is the face and mascot of many American universities and is used in promoting Sports events. Interestingly it is the Mascot of Drake University which hosts one of the oldest athletic events in the United States of America known as the "Drake Relays". The Bulldog is a major part of the festivities of this sporting event every year, and bulldogs from all over the world participate in a contest called "The Beautiful Bulldog" contest in which bull dogs from all over are dressed in different outfits and are judged for several attributes. Color(s): brindle, solid white, red, or fawn, or any of these on a white background. Bulldog breed clubs say that the average life span of the bull dog breed is 8–12 years. Leading causes of death in this popular breed are cardiac related, cancer and old age. Hip Dysplasia is a common dog diseases present in this breed in fact it is the breed with the highest possibility for this dog disease. Other problems can include cherry eye, a protrusion of the inner eyelid (which can be corrected by a veterinarian), certain allergies, and hip issues in older bulldogs. Puppies are frequently delivered by Cesarean section because their characteristically large heads can become lodged in the mother's birth canal during natural birth. Like all dogs, bulldogs require daily exercise. If not properly exercised it is possible for a bulldog to become overweight, which could lead to heart and lung problems, as well as joint issues.